Character entails living the way God has called us to live. Sometimes we expect our children to learn the most important traits in life by chance. This book presents a process that incorporates Explaining, Showing and Practicing, in other words ESP, as a way of teaching character. Each chapter holds Biblical reasons for training, an abundance of ideas and practical examples to inspire and motivate every parent. Honesty, Respect, and Self-Control are some of the character traits expanded on in these pages. Haven’t we each noticed a child that stood out because of his/her character? With God’s grace and a planned approach we too CAN instill character that shines bright. 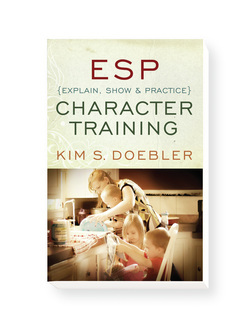 Let Kim come along side you as she shares her personal stories of training children in character. Then as families produce an abundance of young people with godly character there will be a noticeable light spreading throughout our dark world.